The renewal of the rust belt relies on a number of factors, chief among them advanced technology infrastructure, government aid, and Cecil Fielder not eating the first two things. 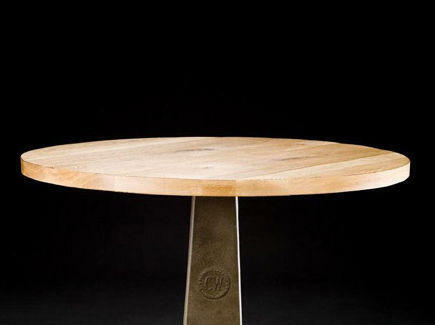 It also takes socially conscious craftsmen, like the guys at AT-95 Furnishings. From a team outta Ohio inspired by their collective blue collar heritage (farmers, machinists, well-drillers...), AT's a line of maddeningly sturdy wood & metal home goods designed to promote "rust belt renewal" by evoking the optimistic legacy of the Industrial Revolution, which accomplished a lot once it decided to not just Dance, Dance. Things start big with a half-dozen tables, from the rectangular Machine Leg, with two steel sawhorse-style legs supporting varnished planks of salvaged white oak; the Double Drafting, which swaps in two cast iron tripod bases for legs, enabling it to support 2000 lbs; and a circular, cast iron joint topped with oak called the CW Industrial, perfect for brawny men who gossip like girls. 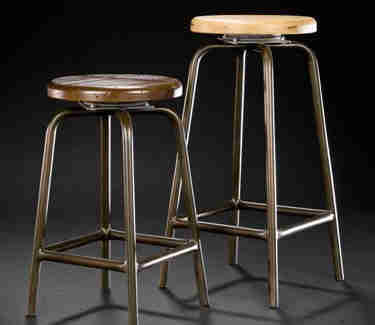 Accompanying seating options run from the backless oak ACME Bench, to a steel framed swiveling stool, to a slotted-back, all-wood barstool called the Schoolhouse, though if your schoolhouse has a bar in it then of course it's going to Rock. Niche-est of all's a bi-leveled, all-steel rolling cart modeled after ones the crew found in a shuttered Hoover factory, which became redundant once Cecil Fielder started sucking in everything.